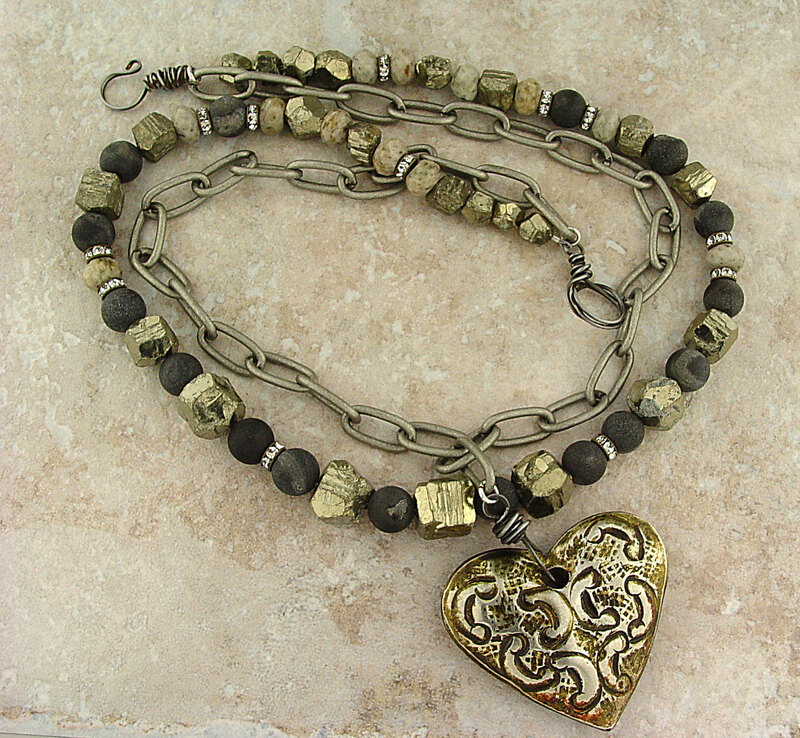 This entry was posted on Friday, May 9th, 2014 at 11:13 pm	and tagged with Barb Solem, bead soup blog party, fools gold, lori anderson, metal me this, Vivimagoo and posted in Bead soup, Beads, Creativity, Exchanges, Jewelry, Metal Me This. You can follow any responses to this entry through the RSS 2.0 feed. Industrial Chic indeed! Love the chunky natural textures and look to it! The Fools Gold nuggets fit perfectly with the focal. I love it. Very cool chunky and fun! I received one of your clasps in my bead soup! So excited i haven’t used it yet. happy Bead Soup Party! I love what you’ve done with your soups. 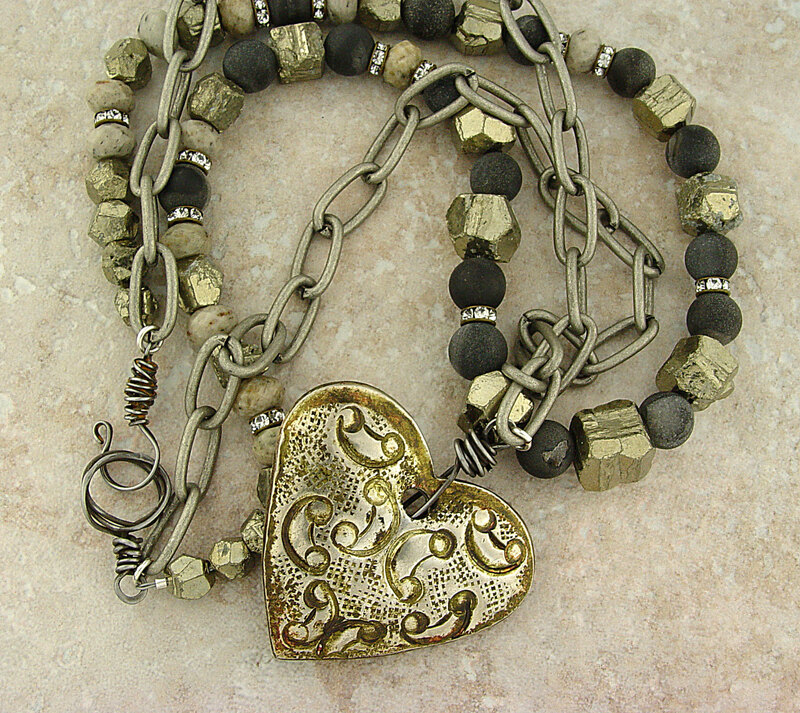 Beautiful combo of material, the dark matte beads and the metal accent make the heart pendant more “serious” and it just pops out right. Love it! Industrial Chic ;0) – it’s an amazing piece, Lisa! It’s inherently consistent, I like it! Love what you did! Fabulous! I love the big and chunky in all kinds of jewelry!!! You did a wonderful job with this. I s is fun and a real Statement piece!! Have a Blessed Day!!! I love your soup! Very industrial chic! Love your industrial chic necklace and earrings! I do a lot of steampunk, so this is right up my alley. LOVE it. Great job! Very cool set! Great job and the heart is fabulous. Cool beans, very industrial chick. I am not a “heart” person, but every once in a while, someone proves the exception. I love this! Love your soup and your absolutely stunning design. Would wear this any time. Wow – love that! 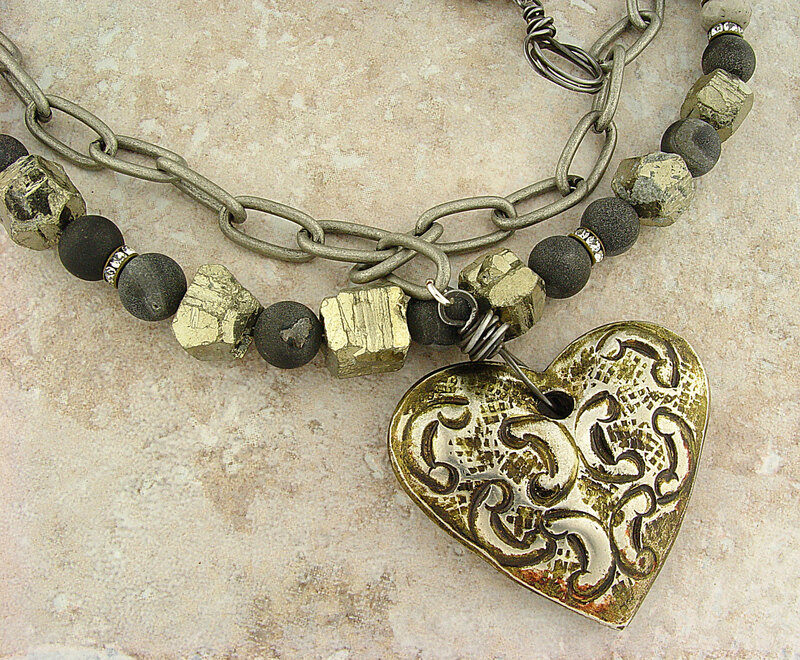 The heart necklace just rocks – very cool. Love this much! Fools gold is perfect! Really like the springs!! I really like your work! The fool’s gold was the perfect addition here — great designs! love your metal edginess style!! beautiful metal soup! Now that piece would look great on a lady in a nice tan suit – or black suit. Industrial Chic indeed. Great work with the components Lisa it’s a beautiful piece. You came to the right result, just gorgeous and the earrings are a perfect set. This I love! I’m going to have to ponder this design for a while. It’s inspiring the heck out of me! I love that industrial look with a little sparkly thrown in. I have some big chunky beads (sort of like the fools gold) and never know how to use them. You’ve got me thinking. Beautiful work! Perfection! Totally love these pieces! Really Soup-er job! I’m inspired! Very cool pieces. Love them. Thanks for all you did to help out for this party Lisa. Very cool set! The fools gold works perfectly! Industrial Chic is a great look – love it! Ha! When I saw your wonderful piece(before reading) I thought” Wow! 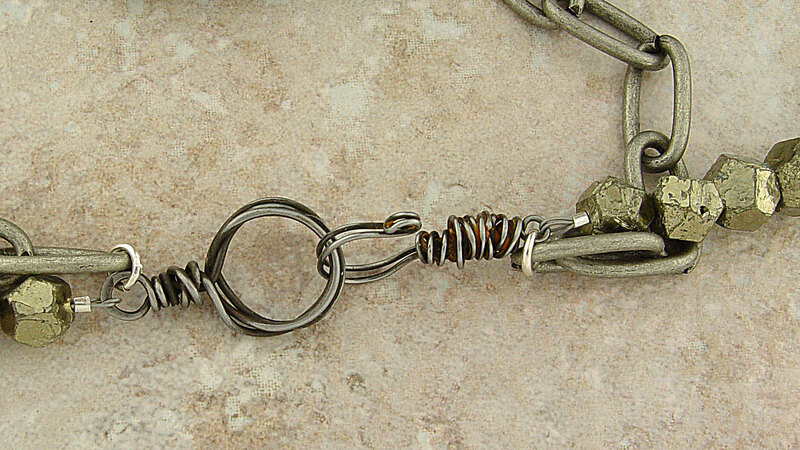 I have no idea what style you would call this but Industrial Chic was what I decided and Voila that’s what it is. I love it. So different from the norm. love, love it! really cool design! i think you did an amazing job with it all! Very cool and wearable pieces! Oh my goodness! Amazing colour scheme! What a colour scheme, stunning! I really love the design, so great! A very elegant necklace, love black and gold! 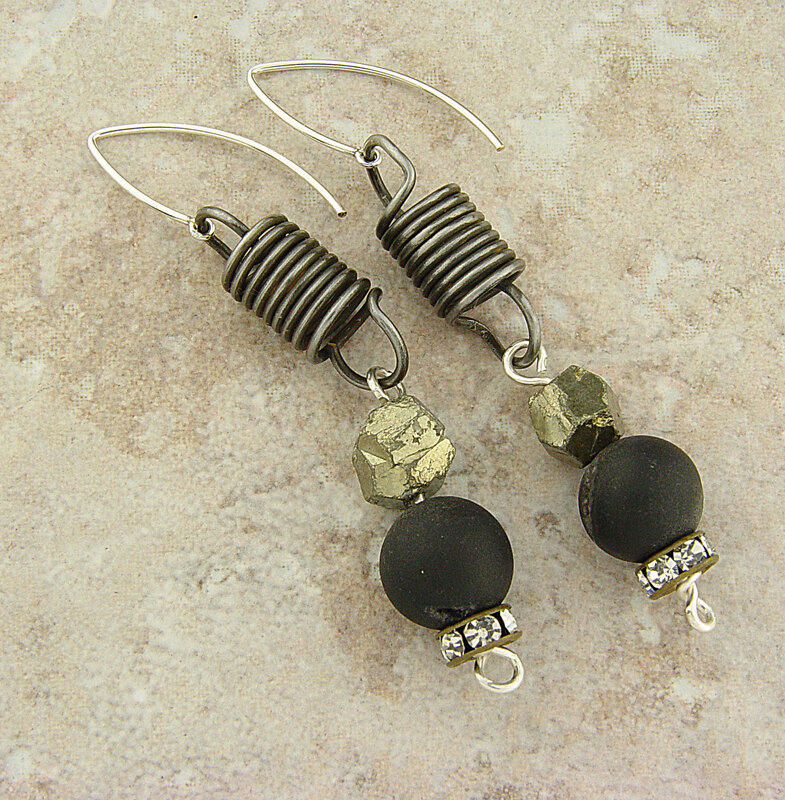 Fabulous and rustic pieces, the use och the springs in the earrings is a fun twist! Very nicely done. Hearts can often be “too cute.” But you have really added sophistication to this one! I really like the final result! Great job! Gorgeous pieces, love the industrial look and it will go with so many things! I’m normally all about the colors, but this fairly monochromatic treatment really worked. Well done! Wicked! I love the simple stylized design, very complimentary to the elements in your soup! You’ve created a beautiful necklace with your soup. 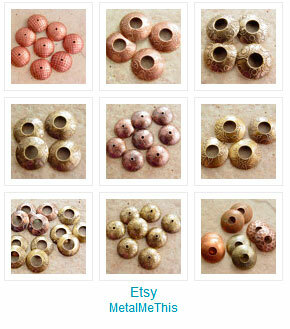 I love how you were so creative with your lovely focal bead – Cheers! You really got some great stuff out of that bead soup. Thanks for sharing it with us! Industrial chic and cool! Great work with your soup! I love what you did with this soup…black and cream and edgy! I love all of it !! I also want to thank You for helping out with this huge party !! Your necklace and earrings are wonderful! Very clever, I would totally wear these. Very metallic/industrial and very chic! Wow Wow!! Totally Industrial chic and so elegant! Your nuggets were the perfect addition! Kudos!! Beautiful necklace and the earrings are lovely too! Wonderfully done! Looks good Lisa, you definitely took the “industrial” idea and ran with it. Beautiful! Love the focal. Putting the fools gold with those beads was so right! It just made it all come together perfectly. Gorgeous – I love the balance of the necklace: heavy, but somehow very feminine. I am not usually fond of the “industrial” look, but you created a wonderful piece! love it! I like industrial chic. It speaks to me. Lovely job on your soup. I love the coil earrings! But truth be told, I love both pieces! Industrial chic never looked so good! Wow! I just love this necklace Lisa. Both feminine and industrial. Best of both worlds! Lisa you rocked the industrial chic look. Most heart designs are fun and frilly. it is great to see one used in an entirely different look. Thanx for helping Lori make this fun challenge happen. An elegant variation of the steam punk style. What a cool set! Love what you did with your soup! That gunmetal chain and the fools gold is awesome with that focal. Love the chunkiness of the necklace and your color scheme. AWESOME! Those Fool’s Gold nuggets really added to it. I love when I find a use for something I just had to have but then was stumped on. Lisa, I could NOT have done this party or run the Bead Soup Cafe without you. I hope you know how much you’re treasured. Love the end result! The pieces are so wearable! Pure GORGEOUSNESS… you did an awesome job with your soup Lisa!! Admiring your design… Look at those pretty fool’s gold nuggets!! What a perfect match with the chains… now I have one to add to my must have item list: fool’s gold nuggets.. Your pieces look so rustic but sophisticated at the same time. I really like what you made with your soup. Fabulous Lisa! Original but gorgeous at the same time! Industrial Chic, indeed! Move over Steampunk…..I see a whole new style emerging!!! A fabulous necklace and pair of earrings to be proud of!!! what fun soup you had to play with! love your design –the gunmetal is a fun look. Waouw, this is definitely a big, bold and beautiful necklace! Wow, romantic but tough! I like it. The pyrite chunks have to be my favorite part of these creations though. They were the perfect addition! Industrial with heart! The design looks carefully premeditated, each detail has its place, looks chic, indeed! I love your take on the Industrial Chic look, and the fool’s gold works very well with the soup. I love how you made the industrial look with both pieces you made. I love how the metals go so well together – even the earrings! Great job!